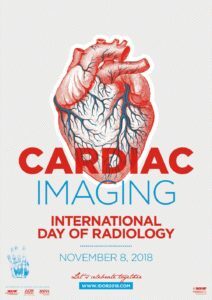 Monday, September 17, 2018 (ESR, Vienna) – The International Day of Radiology (IDoR) will be celebrated for the seventh time on November 8, this year focusing on cardiac imaging. Cardiac imaging is a fast-growing subspecialty of diagnostic radiology that plays a huge part in the assessment and management of heart patients throughout the world. Cardiac radiologists – the experts in charge – supervise or perform imaging examinations, using technology such as computed tomography (CT) and magnetic resonance imaging (MRI), and then interpret the resulting images to diagnose and monitor a wide range of diseases of the heart. For IDoR 2018, we are highlighting the increasingly important role of radiologists in cardiac care, contributing to the diagnosis, pre-procedural work-up and follow-up of patients with a wide variety of cardiac pathology, from coronary artery disease and leaky heart valves to defects in the size and shape of the heart. To underline the significance of cardiac imaging in various regions of the world and to show its current place in today’s medical healthcare spectrum, the ESR has conducted numerous interviews with experts throughout Europe, Latin America and Asia, as well as with individuals from Canada, South Africa and Egypt. The stunning IDoR 2018 poster can again be downloaded on the IDoR website; this year it is available in 30 languages, covering a great variety from Icelandic to Nepalese. A publication on this year’s main theme is currently in the making; books from previous years on emergency radiology, breast imaging, paediatric imaging, brain imaging and thoracic imaging are still available for download on the IDoR website. As in previous years, more than 160 radiology-related professional societies from around the world will participate in the International Day of Radiology, holding a range of different events to celebrate, such as public lectures, department open days, conferences, and press events. The International Day of Radiology was launched in 2012 and is a joint initiative of the European Society of Radiology (ESR), the Radiological Society of North America (RSNA) and the American College of Radiology (ACR). It is an annual event held with the aim of building greater awareness of the value that radiology contributes to safe patient care, and improving understanding of the vital role radiologists play in the healthcare continuum. November 8, the day that Wilhelm Conrad Röntgen discovered the existence of x-rays in 1895, was chosen as a day of action and awareness. The organisers hope to alert the world to the stunning medical, scientific and even artistic possibilities of medical imaging, the essential role of the radiologist as a part of the healthcare team in countless medical scenarios, and the high educational and professional standards required of all staff working in medical imaging. To keep up to date with the latest announcements about the International Day of Radiology, visit the International Day of Radiology Facebook page or the IDoR website idor2018.com.